How has the Internet distributed power between the artist and the audience? What does intellectual property law mean in the age of screenshots and Tumblr reposts? Who are all of these "sad boy" net artists, and why are the boys so sad? 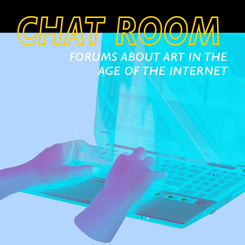 Chat Room is a quarterly forum on art in the age of the Internet, with a new topic for each edition. Chat Room aims to demystify the fundamental questions about art and its broader place in society in a playful and approachable manner. Expect Powerpoint presentations, serious discussion, games, and A-ha moments worthy of Oprah. Join us for the inaugural edition of Chat Room, on the topics of value, labor and the quantification of art work. Chat Room is organized and hosted by Minh Nguyen and produced by Claire Buss. Visit www.chatroom.vision for more information.